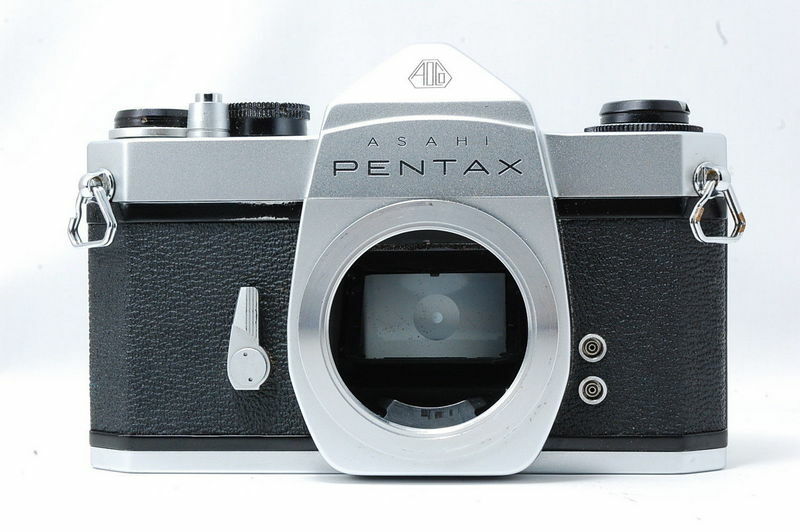 A few days before Christmas I stumbled across a chrome Pentax SL body on eBay for $ 8.40 plus $15.00 shipping from Japan total of $23.40 (eBay item # 123540212897). Even though I already have two SL bodies I bought it. The finder was filthy, had some fungus in it and a murky black horizontal line through it when you looked through it. Otherwise it was clean. I figured if the finder couldn't be fixed I'd still have a cheap parts body. The body arrived promptly and I was happy with it. Re-packed it and sent it to Eric for a CLA. Eric replaced the prism, replaced the seals, and serviced the shutter. Total cost including shiping shipping was $107. It cost me $12 to mail it to Eric so total cost came to $142.40. Not bad at all. That may seem high but it is in like new shape & will last me for at least 10 years so I'm happy and I save one from the trash bin. The SL has no light meter and is a pure mechanical camera. I now have 3 SL bodies. The black one I bought out of a pawn shop in Texas way back in 1978. Its had hundreds of rolls of film through it. It sports a Nikon P Apollo screen, Leica screw-over cable release, Pentax LX lower strap lugs, and Ritz Camera "Ruggedized" skin covering. While I was on active duty it took a 200 foot fall in a rucksack that broke free during a parachute jump. Didn't bother it in the least. The Pentax SL is my favorite m42 body. I am planning on putting another Nikon P screen in it. What does that Nikon screen look like and is it easy to swap? The Nikon P screen was designed for the Nikon F that was supposed to have been used on the Apollo space missions. When the F2 came out, Nikon updated the F with a plastic tip advance lever. The P screen was introduced at this time so it's been known as the Apollo screen. Space use or not, it's a nice screen to use here on Earth . The P screen has a central 45 degree split image rangefinder, surrounded by a micro-prism spot, surrounded by a larger matte field, with vertical and horizontal cross hairs through the center from edge to edge. I used them a lot back in the day with my Nikon F & F2 cameras. Kinda hard to find now a days & $$$. When Pentax started offering service-center only replacement screens for the Spotmatics they used (drum roll................... !) Nikon screens! The repairman who installed the P screen into my SL around 1987ish had worked for Honeywell for 20 years servicing Pentax cameras then went out on his own. He told me he had installed hundreds of them over the years. He said that they dropped right in. At that time I had around 12 Spotmatics, two with motor drives that he fixed. He install an all matt Type D and a grid Type E in two other Spotmactics of mine when I had him CLA the bodies. I'm sorry I sold off those bodies - should have kept them. The E grid screen is easier to find and I'm thinking of doing one the chrome SL bodies with one. I've never tried to swap ot the screen although I have pulled a couple of Spotmatic tops. I'd leave it to a pro. I bought a F2 ~6 months ago, and it had the P screen installed, and it’s my favorite screen on any of my cameras. F2 screens have a frame around the outside, so I wonder if that’s removed? Yes, it comes out of the frame.